Word Password Recovery is the best Word password cracker to recover forgotten passwords for protected Word documents (*.doc, *.docx) created in Microsoft Office 2016, 2013, 2010, 2007, 2003, XP, 2000 and 97. Easily recover MS Word password using combination of Brute-force attack, Mask attack or Dictionary attack. Simply select your Word document (*.doc, *.docx) and wait for a few minutes while your password is recovered. Recover your lost Microsoft Word passwords the fast and easy way. Support most of the document encryption algorithms in MS Office. Simple and intuitive graphic interface. Support Word documents created in MS Office Word 2016, 2013, 2010, 2007, 2003, XP, 2000, 97. Recover lost or forgotten Word documents passwords. Unlock and open password-protected Word documents. Instantly unlock read-only Word document by removing the modify password. Offer various recovery methods: Brute-force attack, Mask attack or Dictionary attack. 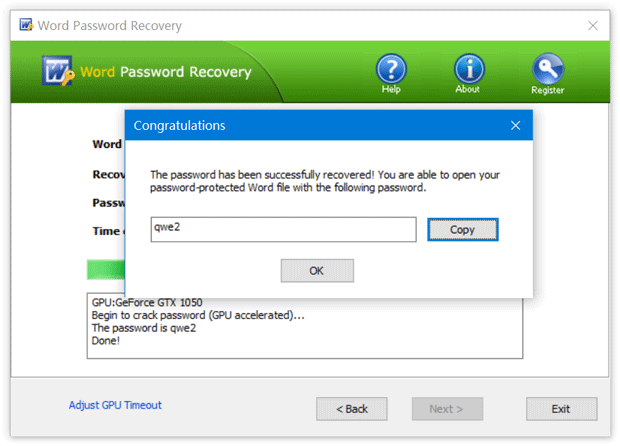 Automatically detect NVIDIA and ATI GPU cards available to accelerate password recovery by up to 50 times. Take advantage of multi-threading technology to speed up the recovery process. Brute-force attack - It attempts all possible combinations of passwords until the correct password is found. The password recovery engine is highly optimized, thus short password can be recovered immediately. Mask attack - If you remember the password partially you can set a mask with the mask symbols for those parts you can't remember, it will help you effectively shorten the recovery time compared with brute-force attack. Dictionary attack - Since many people use regular words or phrases for password, perform a dictionary attack by trying each word from the dictionary will save your precious time. Screenshot 1: Recover forgotten MS Word password and unprotect Word document easily! Microsoft Office Word has an option to protect Word document with a password to prevent it from opening by unauthorized users. But if you have forgotten or lost the password of Word file due to any of the following reasons, then you can easily recover it using Word Password Recovery. You saved a Word document a long time ago and now can't remember the password for it. You have put together a document in Word and locked it for safety and now cannot think of the password having tried about 30 different options! You have a Word file which is password protected but forgotten the password. Somebody deliberately changed the common password of an official document etc. Your brother got onto my computer and changed all of your Microsoft Word Documents to Password to Open. "A while back I password protected a word 2007 document. Now I need to open but cannot remember the password. It's really important as its got all my passwords in it and i am stuck without it. I tries two other recovery programs to no avail. Amazingly, Word Password Recovery helps me recover the lost password! We can't thank you enough." "I saved a word document a long time ago and now can't remember the password for it. Your program amazingly recovered the password in less than five minutes." "I have forgotten the password which I have given to my word document. With your program I can open the document now! Many thanks again for this tool, you saved me a lot of time!" 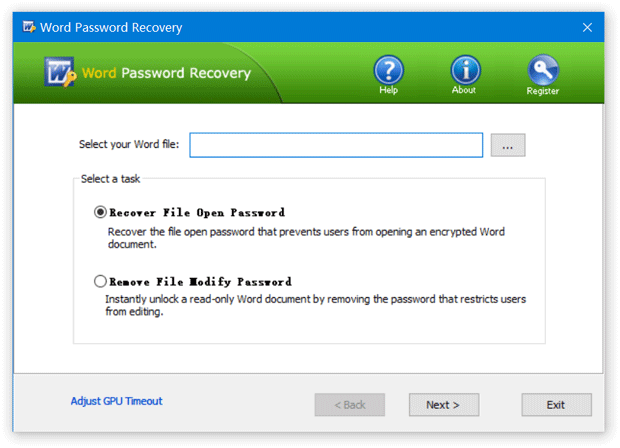 Learn How can you recover forgotten Word password easily with Word Password Recovery program. Dictionary Attack mode is not available. A must-have toolkit to recover passwords for Windows, PDF, Word, Excel, PowerPoint, RAR/ZIP, Outlook, Windows Mail, MSN, FTP and more. Forgot Windows password or get locked out of Windows account? With PCUnlocker you can reset lost Windows password and unlock your computer easily.